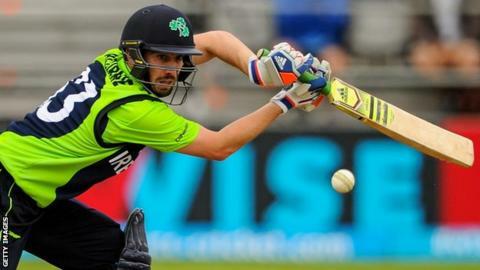 A superb unbeaten 145 from Andrew Balbirnie helped Ireland to a four-wicket win over Afghanistan in the third one-day international. Balbirnie hit eight sixes - an Ireland record - in his highest ODI score as they chased 257 with an over to spare in Dehradun to level the series at 1-1. He added 143 with George Dockrell, who made 54 after Ireland slipped to 29-3 and 73-4. Najibullah Zadran made an unbeaten 104 in Afghanistan's 256-8. After losing the opening T20 series 3-0 against the Afghans and going 1-0 down in the five-match one-day series, Ireland's Balbirnie-inspired victory on Tuesday is a huge boost for Graham Ford's side in a tour which will conclude with a Test match starting on 15 March. Irish captain William Porterfield hailed Balbirnie's "phenomenal" innings while the man of the match was thrilled after his heroics. "When you go out and bat, you dream of having that kind of knock, so to do it is just great," said Balbirnie. "It's a long tour, so to get that win going in with two games to go is huge for the team." Balbirnie paid tribute to Dockrell's vital innings which helped the Irish regroup from their bad start in the runs chase. "He batted brilliantly. He's been given the role as number six because he's shown he can be a batter in this team. "He came in and showed a calm head, he knew what he wanted to do, and that took a bit of pressure off me." With Sunday's second game in the series having been abandoned because of rain, the fourth ODI takes place at the same venue on Friday, before the series finale on Sunday. Zadran's century, along with 75 from captain Asghar Afghan - they shared a sixth-wicket stand of 117 - rescued Afghanistan from 74-5 after they won the toss. Boyd Rankin took 2-56 and Tim Murtagh 2-60 for Ireland. Balbirnie entered the fray at 13-1 and another two wickets quickly fell before a brisk 21 from Kevin O'Brien. The brilliant partnership with Dockrell proved decisive as Ireland finally registered a win over the Afghans at the sixth attempt.